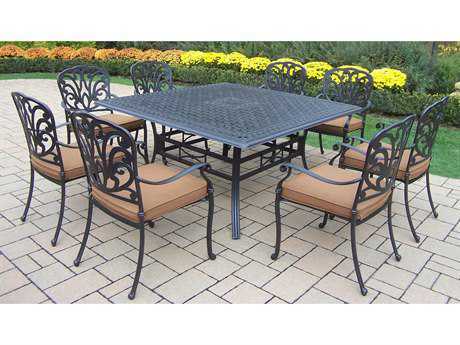 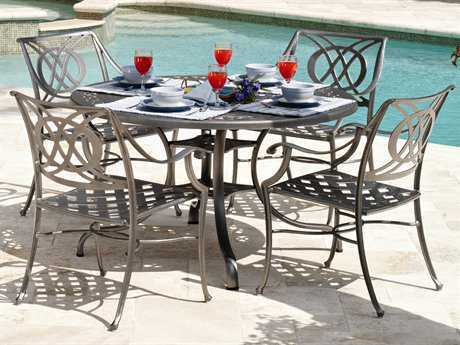 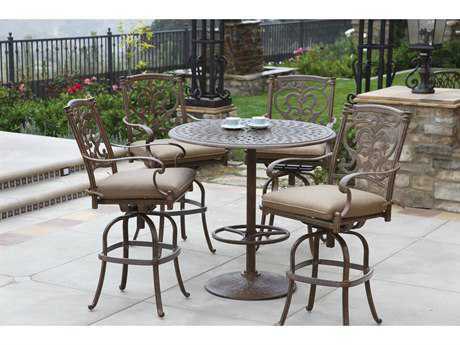 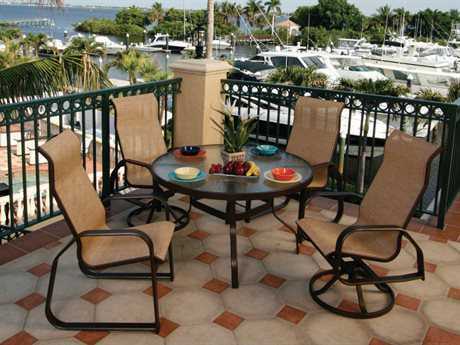 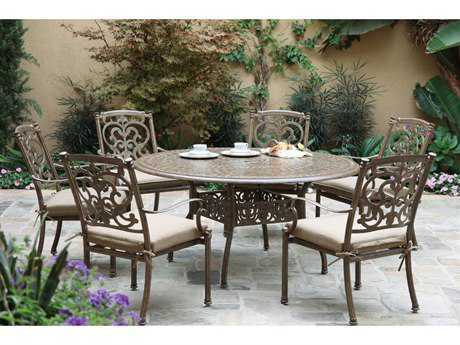 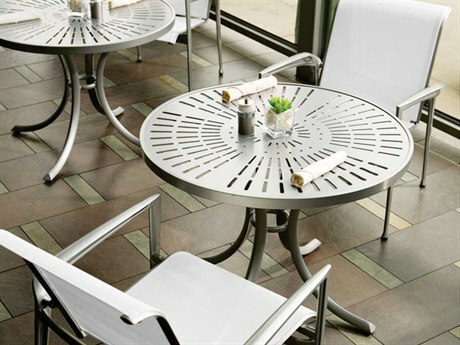 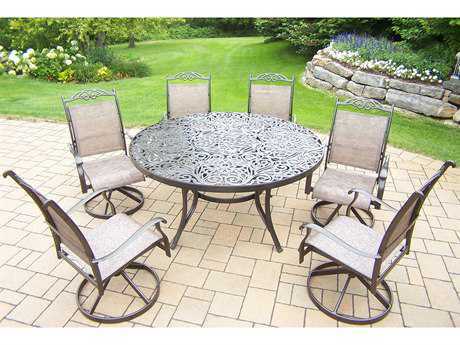 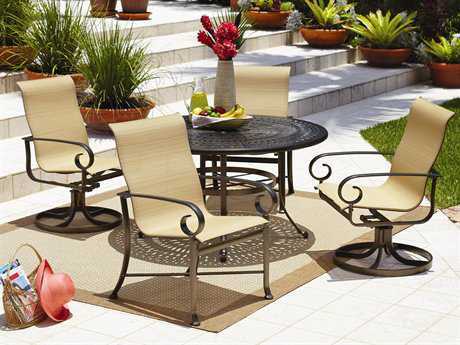 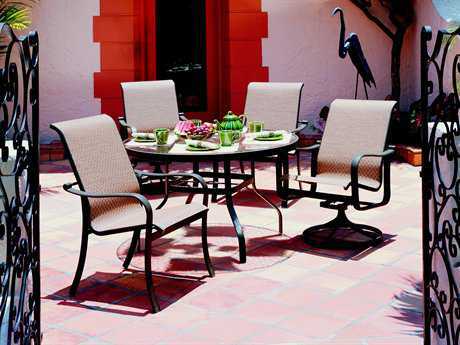 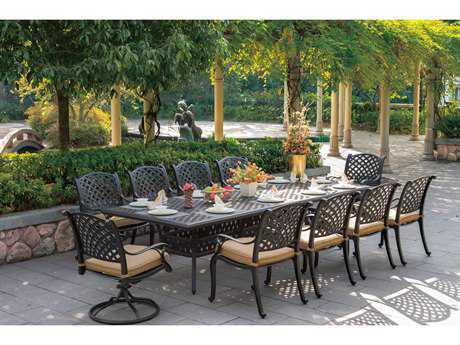 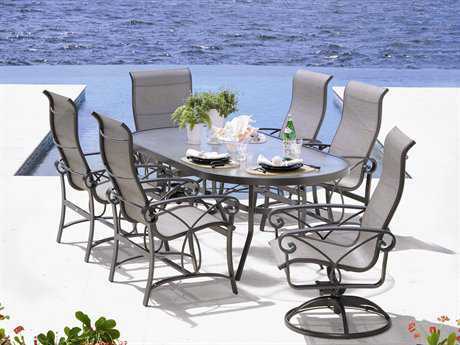 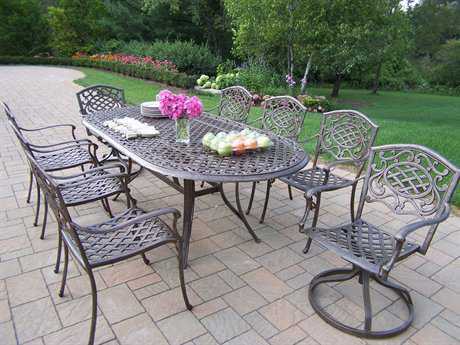 Cast aluminum patio dining sets are available from many leading brands in the outdoor furniture industry on PatioLiving. 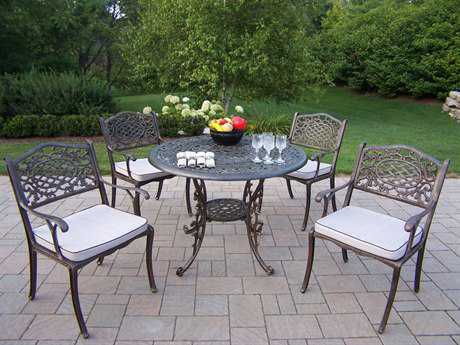 These sets are the ideal solution for creating a versatile, inexpensive exterior entertaining space where you can dine and gather with family or friends. 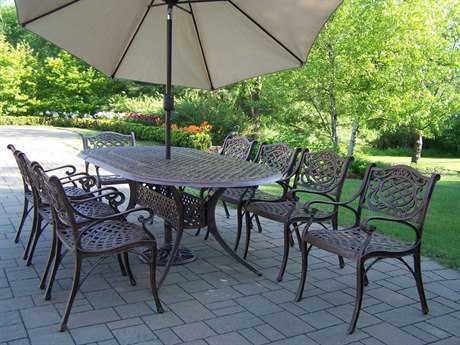 Cast aluminum is made from similar materials as regular aluminum furniture, but the manufacturing process is different. 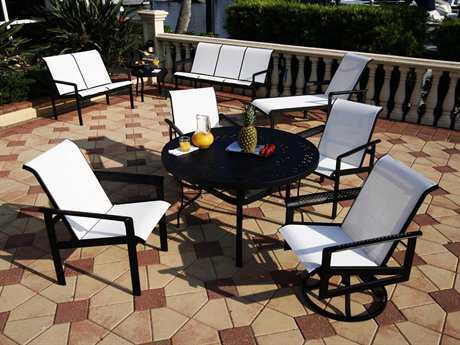 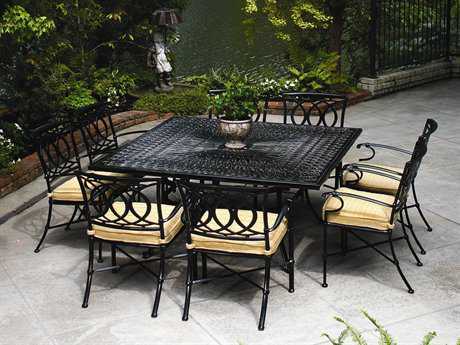 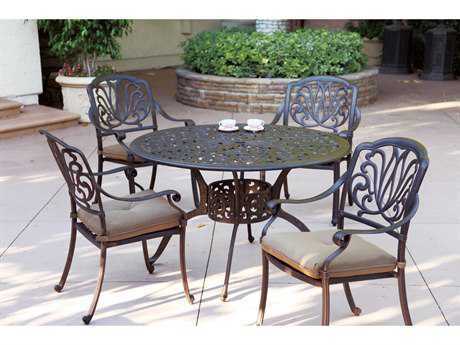 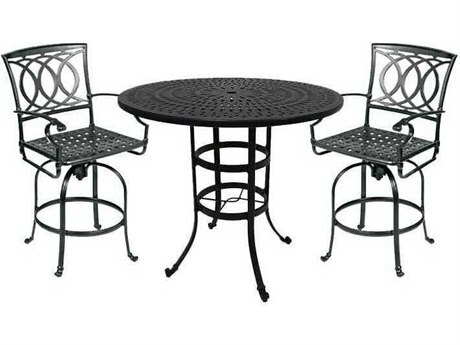 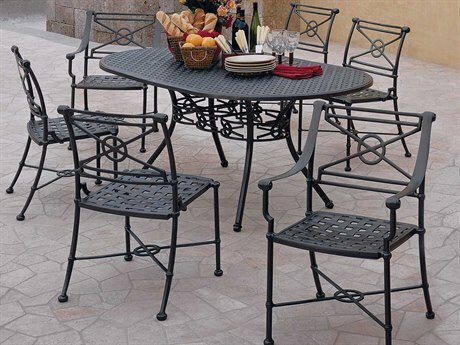 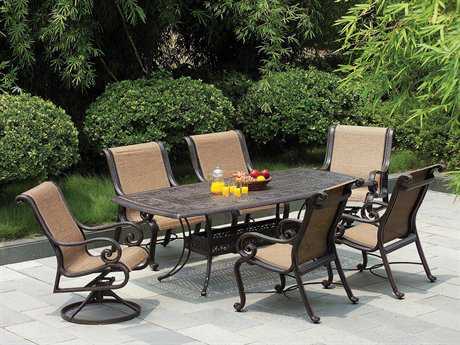 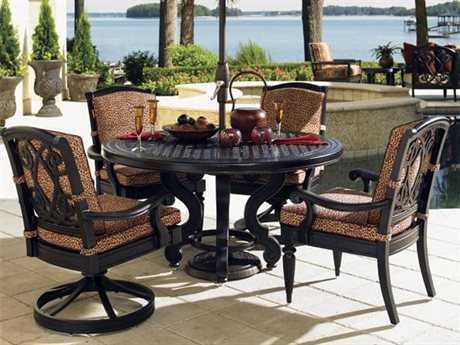 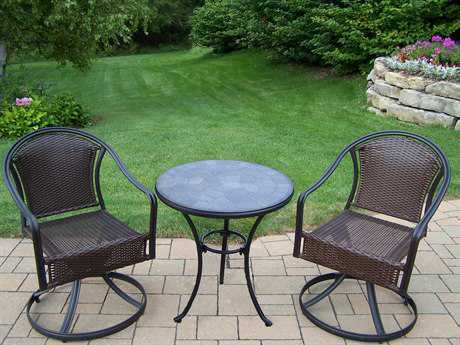 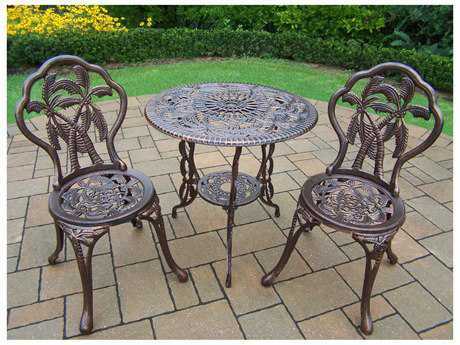 To make cast aluminum outdoor dining sets, molten, melted aluminum is poured into highly detailed furniture molds. 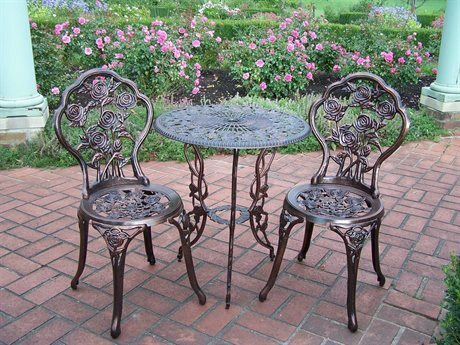 A unique mold is used to create each distinctive cast aluminum piece, and the advanced manufacturing process allows for the production of inexpensive, highly consistent, lightweight, furniture with intricate and unique details. 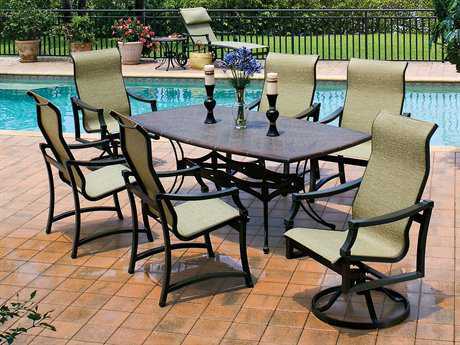 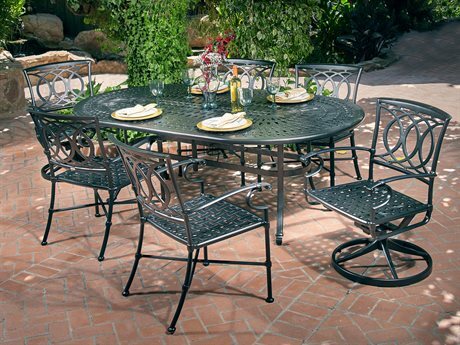 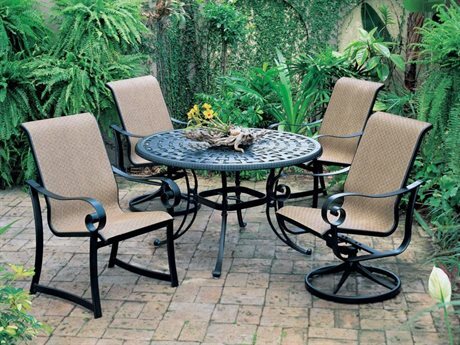 Cast aluminum outdoor dining sets include a table>/a> that is typically round, rectangular, or square, as well as complimentary dining chairs. 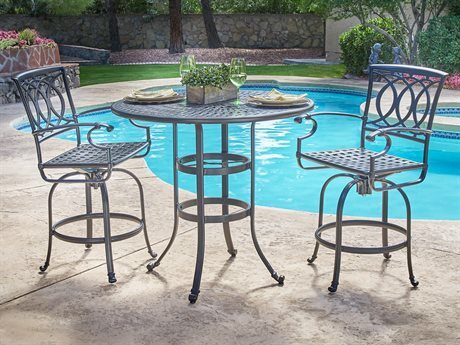 Cast aluminum is typically treated with a powder coated finish that is baked into the surface of the furniture piece, for sets that will not rust or lose their stunning original appearance. 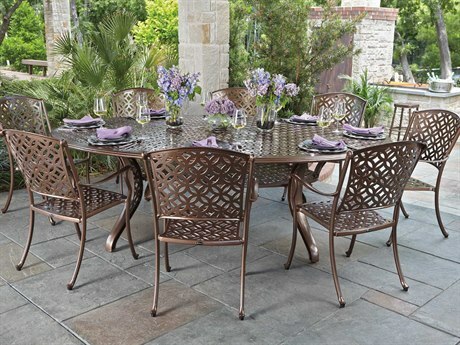 No matter how you prefer to dine or entertain al fresco, find the cast aluminum patio dining sets you’re looking for on PatioLiving. 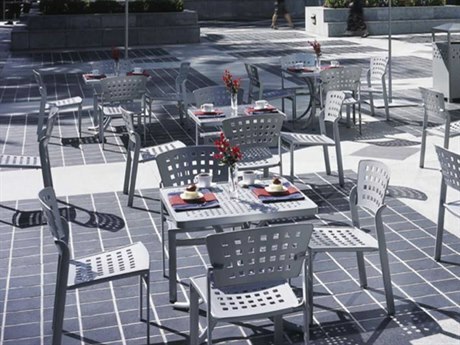 From traditional to modern, cast aluminum patio dining sets are offered in almost every shape and style. 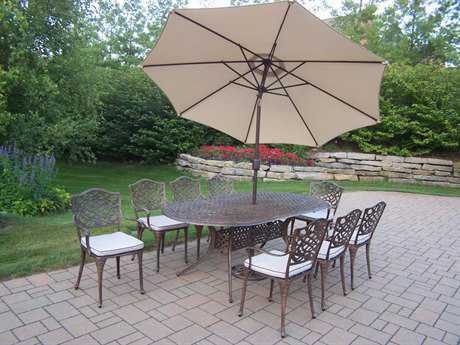 The highly customizable production process allows for the gamut of details and designs, meaning it’s easy to find exactly the set you’re looking for. 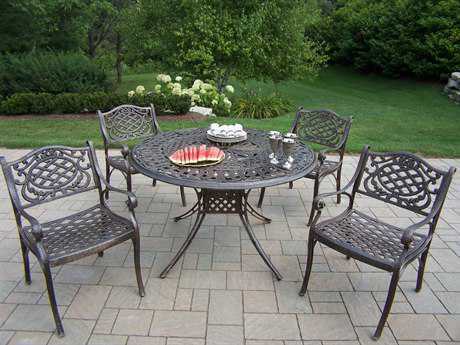 Our inventory includes traditional ornate sets, as well as clean-lined and simple options. 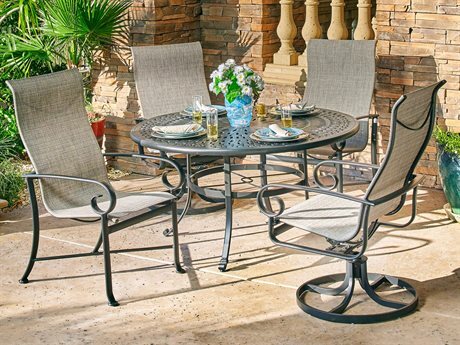 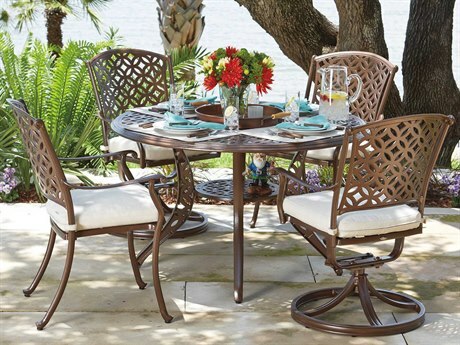 These sets are very lightweight, so it’s easy to refresh and rearrange the look of your outdoor dining arrangement. 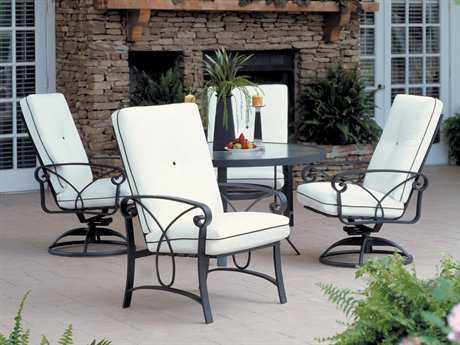 Cast aluminum has a naturally chromatic finish, but these furniture pieces can be customized with a variety of finish colors and sheens. 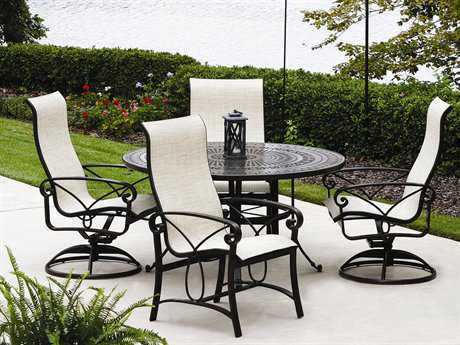 To achieve a sleek, modern look, you can opt for a matte black finish. 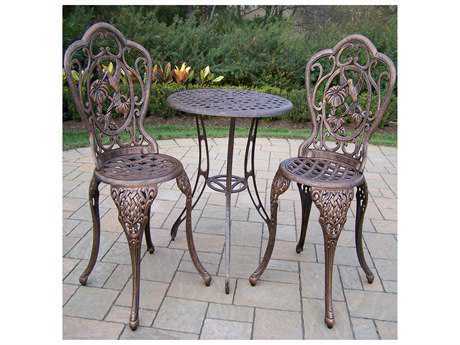 For an aged and distressed look, cast aluminum can be finished with weathered bronze or copper. 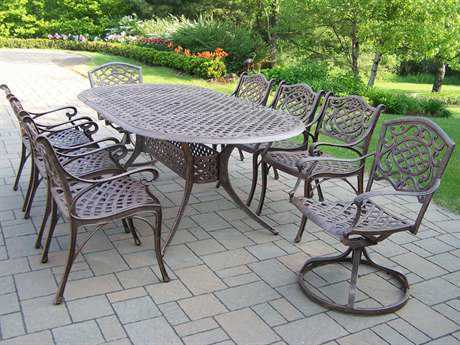 Cast aluminum outdoor dining sets include sets ranging from two person bistro styles to large sets with enough room for ten people or more. 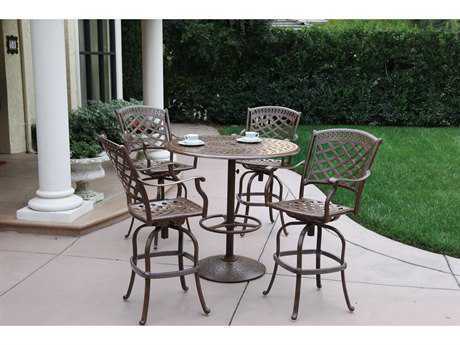 Bistro sets are ideal in smaller outdoor settings where space is limited, such as small verandas or balconies. 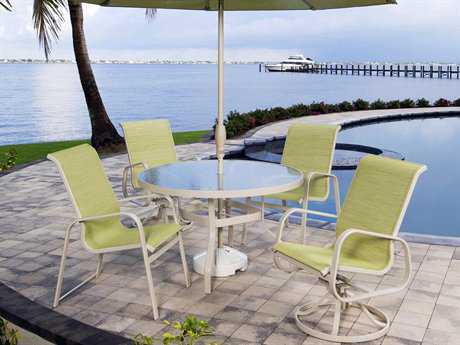 Larger sets are the perfect solution for filling up a sizable pato space, or for anyone who regularly entertains large groups. 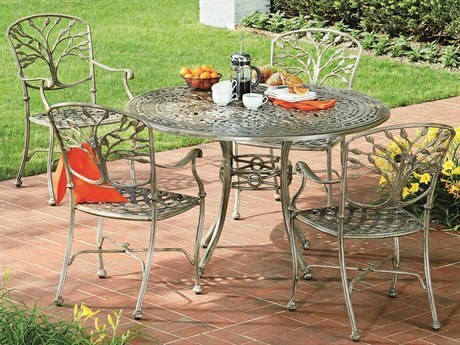 These dining sets can easily be decorated with any table decorations that you might see topping an indoor table, and the material pair effortlessly with cast aluminum lounge sets.